After taking many steps backwards and only some steps forward in this issue, Sam, Steven, and I chatted about the best way to characterize methylation trends in C. virginica. We decided it would be best to use this file Sam made, which is a concatenation of all CpGs in my data, each with one coverage and percent methylation metric. In this Jupyter notebook, I downloaded Sam’s file, counted lines, and filtered out all loci with a minimum of 5x coverage. I then identified methylated, partially methylated, and unmethylated loci. Figures 1-3. All CpGs, methylated, sparsely methylated, and unmethylated loci in all C. virginica gonad samples. Looking at the screenshots, it does seem like most of my data is methylated. It’s possible that gonad tissue has a higher methylation rate than ctenidia (what Mac used to describe C. gigas methylation trends), or that there really is a species difference. It may also be beneficial to set a 75% cutoff to define a locus as methylated. These are things I need to dig into in my discussion. In the meantime, remade my frequency distribution with this code. Figure 4. 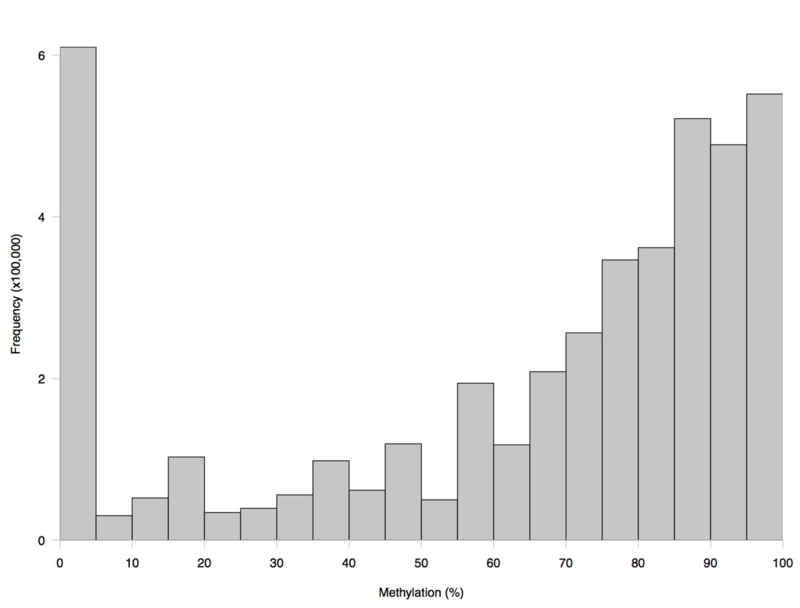 Frequency distribution of methylated CpGs in C. virginica gonad data. Using the new list of methylated loci, I characterized the location of the loci in the C. virginica genome. Methylated CpGs were found primarily in genic regions, with 2,437,901 (76.6%) loci in 44,505 unique genes. Methylated loci were also concentrated in exons, with 1,013,691 CpGs (31.9%) in exons versus 1,448,786 (45.5%) loci in introns. 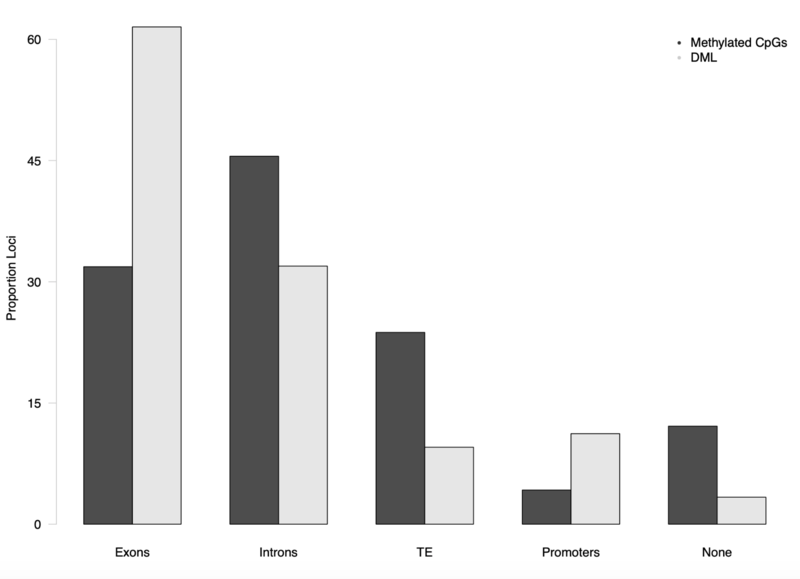 Transposable elements contained (TE-all) 755,222 methylated CpGs (23.7%), with 610,208 loci (19.2%) overlapping with TE-Cg. Putative promoter regions 1 kb upstream of transcription start sites overlapped with 134,534 loci (4.2%). There were 386,003 methylated loci (12.1%) that did not overlap with either exons, introns, transposable elements, or promoter regions. I intially thought I would make one figure comparing total CpGs, methylated CpGs, and DML, but Steven said I should only compare a list of interest to its background. This means I need to make two separate figures: one to compare total and methylated CpGs, and one to compare methylated CpGs and DML. 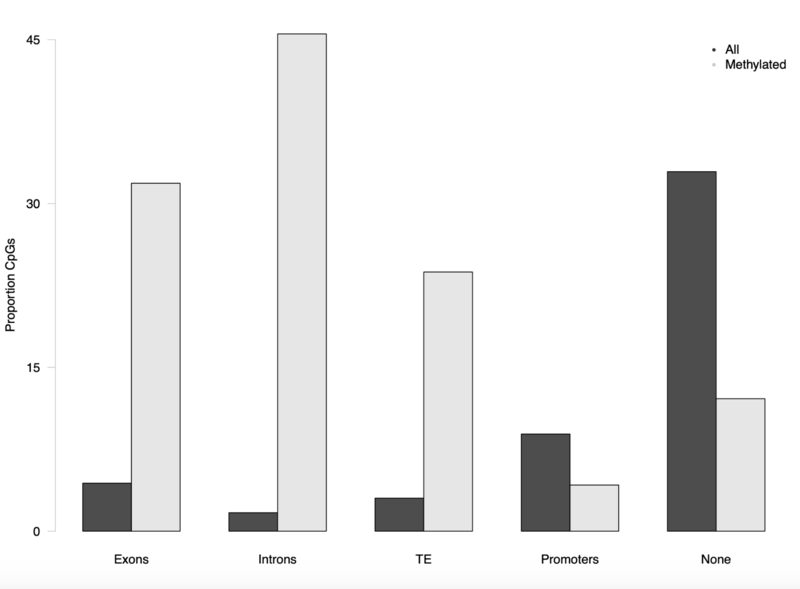 I quickly went into this Jupyter notebook to count how many CG motifs did not overlap with either exons, introns, transposable elements (all), or putative promoters. I found 4760,788 CpGs did not overlap with any characterized region. Then, I created this file in Excel (there’s probably a way to automate this but I can’t think of it right now) with genomic locations for all CpGs, methylated CpGs, and DML. From my chi-squared test of homogeneity in this R Markdown file, I found that the distribution of methylated CpGs in the C. virginica genome was different than the distribution of all CpGs (chi-squared = 5,028,800, df = 4, p-value < 2.2e-16). Similarly, the distribution of DML was different than the distribution of methylated CpGs (chi-squared = 347.01, df = 4, p-value < 2.2e-16). I couldn’t figure out the best way to conduct a post-hoc test, so instead I made figures.